Desulfohalobium retbaense (Ollivier et al. 1991) is the type species of the polyphyletic genus Desulfohalobium, which comprises, at the time of writing, two species and represents the family Desulfohalobiaceae within the Deltaproteobacteria. D. retbaense is a moderately halophilic sulfate-reducing bacterium, which can utilize H2 and a limited range of organic substrates, which are incompletely oxidized to acetate and CO2, for growth. The type strain HR100T was isolated from sediments of the hypersaline Retba Lake in Senegal. Here we describe the features of this organism, together with the complete genome sequence and annotation. This is the first completed genome sequence of a member of the family Desulfohalobiaceae. 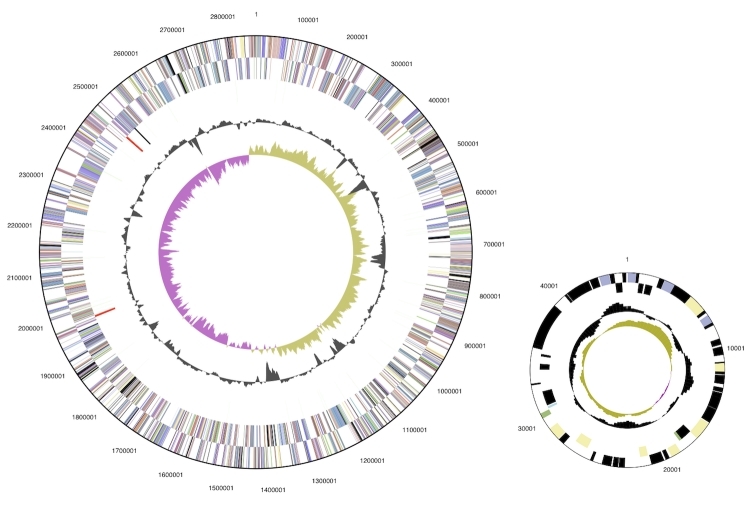 The 2,909,567 bp genome (one chromosome and a 45,263 bp plasmid) with its 2,552 protein-coding and 57 RNA genes is a part of the Genomic Encyclopedia of Bacteria and Archaea project. Strain HR100T (= DSM 5692) is the type strain of the species Desulfohalobium retbaense . HR100T is the only strain available from culture collections belonging to this species and was isolated from surface sediments of the hypersaline Retba Lake in Senegal (Western Africa). This strain was the first cultivated sulfate-reducing bacterium, which grows in media containing NaCl concentrations up to 24% and the first described hydrogenotrophic anaerobe able to grow at salinities above 10% . Interestingly, the total salt concentration of the Retba Lake was 34% at the time of sampling, which would indicate that cells of this strain were not able to proliferate in the habitat from which they were originally isolated. This phenomenon was later also reported in a study on the diversity of sulfate-reducing bacteria in hypersaline sediments of the Great Salt Lake (Utah) . This effect could either be explained by niches of lower salinity in the respective habitats, which would allow proliferation at distinct sites or, alternatively, that the in vitro halotolerance of these strains is different from the salt tolerance in the natural environment. One reason for the observed growth inhibition of sulfate-reducers at salinities above 24% may be the energy expensive synthesis of compatible osmotic solutes, which are required in large amounts to retain cellular integrity at high external salt concentrations. Under anoxic conditions bacteria that depend on sulfate as electron acceptor gain less energy than microorganisms that use photosynthesis or denitrification for growth, so that the latter metabolic types have a selective advantage in hypersaline environments . Here we present a summary classification and a set of features for D. retbaense strain HR100T, together with the description of the complete genomic sequencing and annotation. So far, no 16S rRNA gene sequences with high similarity (>95%) to the sequence of D. retbaense have been deposited in public databases, although several anoxic sediments with high salinity have been analyzed by cultivation independent methods (as of October 2009) since D. retbaense was described. 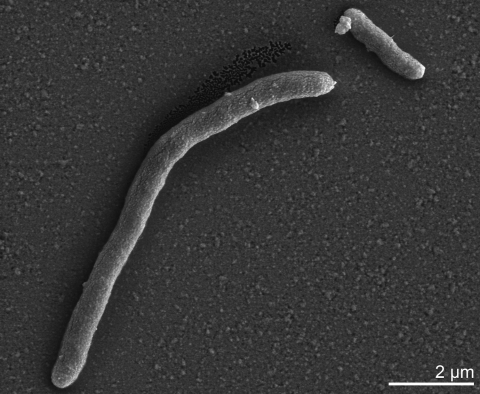 Consequently, it appears that cells of sulfate-reducing bacteria related to this species are of very low abundance in most hypersaline environments. Besides several strains of the genus Desulfovibrio, the only other member of the order Desulfovibrionales with a sequenced genome is Desulfomicrobium baculatum type strain XT . D. retbaense is the type species of the genus Desulfohalobium, which represents the recently proposed family Desulfohalobiaceae within the class Deltaproteobacteria . The genus Desulfohalobium is currently polyphyletic due to the species D. utahense, which is phylogenetically more closely related to Desulfovermiculus halophilus, with high bootstrapping support in the 16S rRNA tree (Figure 1) Also, both share a 16S rRNA gene sequence similarity of 96.9%, whereas the two Desulfohalobium species display a sequence similarity of only 90.5%. Hence,it is possible that the species D. utahense has been misclassified, although itappears to be phenotypically more similar to D. retbaense than to Desulfovermiculus halophilus . The taxonomy of the two genera thus needs to be reconsidered. Phylogenetic tree highlighting the position of strain HR100T, D. retbaense DSM 5692, relative to the other type strains within the family. The tree was inferred from 1,386 aligned characters [6,7] of the 16S rRNA gene sequence under the maximum likelihood criterion  and rooted in accordance with the type strain of the order Desulfovibrionales. The branches are scaled in terms of the expected number of substitutions per site. Numbers above branches are support values from 1,000 bootstrap replicates if larger than 60%. Lineages with type strain genome sequencing projects registered in GOLD  are shown in blue, published genomes in bold. Figure 1 shows the phylogenetic neighborhood of D. retbaense strain HR100T in a 16S rRNA based tree. The two 16S rRNA gene copies in the genome of strain HR100T do not differ from each other, and differ by four nucleotides from the previously published 16S rRNA sequence generated from DSM 5692 (X99235). The difference between the genome data and the reported 16S rRNA gene sequence is most likely due to sequencing errors in the previously reported sequence data. Cells of D. retbaense HR100T are straight to slightly curved rods with rounded ends (Table 1 and Figure 2). They have dimensions of 0.7-0.9 x 1-3 µm and stain Gram-negative. In medium containing lactate as substrate, cells can form filaments up to 20 µm in length. Motility is conferred by one or two polar flagella . Evidence codes - IDA: Inferred from Direct Assay (first time in publication); TAS: Traceable Author Statement (i.e., a direct report exists in the literature); NAS: Non-traceable Author Statement (i.e., not directly observed for the living, isolated sample, but based on a generally accepted property for the species, or anecdotal evidence). These evidence codes are from the Gene Ontology project . If the evidence code is IDA, then the property was directly observed for a live isolate by one of the authors or an expert mentioned in the acknowledgments. Strain HR100T is halophilic and requires NaCl and MgCl2 for growth. The optimal NaCl concentration for growth is near 10% and salinities up to 24% are tolerated. The pH range for growth is 5.5 to 8.0 with an optimum between pH 6.5 and 7.0. Growth of this strain occurs at temperatures from 25 to 43°C and is optimal between 37 and 40°C . The nutritional characteristics of strain HR100T are as follows: Vitamins and an organic carbon source are required for growth in mineral medium. Hydrogen is utilized mixotrophically with acetate, yeast extract or biotrypcase as the carbon source, but not autotrophically. Organic carbon sources supporting growth are formate, ethanol, pyruvate and lactate. Sulfate, sulfur, thiosulfate and sulfite are used as electron acceptors and are reduced to H2S. In the absence of sulfate pyruvate can be also utilized fermentatively . Spectrophotometry of cell extracts indicate the presence of soluble c-type cytochromes having absorption maxima at 418.5, 522.5 and 552 nm in the reduced state, which would be characteristic for cytochrome c3. A dissimilatory sulfite reductase with a similar absorption spectrum as the enzyme of Desulfomicrobium baculatum (desulforubidin) was detected, but no desulfoviridin, which is diagnostic for members of the genus Desulfovibrio . The respiratory lipoquinone composition of strain HR100T has not been reported, but the moderately related species Desulfovermiculus halophilus was shown to contain the menaquinone MK-7 . The whole cell fatty acid pattern of strain HR100T is dominated by straight- and branched-chain saturated fatty acids (approx. 68%). Branched chain saturated fatty acids account for 30% of the total fatty acids, with iso-C15:0 predominating. In addition, the fatty acid profile contains branched-chain, mono-unsaturated fatty acids, such as iso-C17:1ω7c and branched C18:1 ω 6 . This organism was selected for sequencing on the basis of its phylogenetic position, and is part of the Genomic Encyclopedia of Bacteria and Archaea project . The genome project is deposited in the Genomes OnLine Database  and the complete genome sequence is available in GenBank. Sequencing, finishing and annotation were performed by the DOE Joint Genome Institute (JGI). A summary of the project information is shown in Table 2. D. retbaense strain HR100T, DSM 5692, was grown anaerobically in DSMZ medium 499  at 35°C. DNA was isolated from 1-1.5 g of cell paste using Qiagen Genomic 500 DNA Kit (Qiagen, Hilden, Germany) following the manufacturer's instructions. The genome was sequenced using a combination of 8 kb and fosmid DNA libraries. All general aspects of library construction and sequencing performed at the JGI can be found at the Web Site. The Phred/Phrap/Consed software package (Web Site) was used for sequence assembly and quality assessment. Possible mis-assemblies were corrected with Dupfinisher  or transposon bombing of bridging clones . Gaps between contigs were closed by editing in Consed, custom primer walk or PCR amplification. Sanger finishing reads (n=889) were produced to close gaps and to raise the quality of the finished sequence. The error rate of the completed genome sequence is less than 1 in 100,000. The final assembly consists of 42,114 Sanger reads. Together all sequence provided 10.7× coverage of the genome. The 2,909,567 bp genome consists of a 2,864,304 bp long chromosome and a 45,263 bp long plasmid with a 57.3% GC content (Table 3 and Figure 3). Of the 2,609 genes predicted, 2,552 were protein coding genes, and 57 RNAs; 29 pseudogenes were also identified. The majority of the protein-coding genes (73.6%) were assigned with a putative function while those remaining were annotated as hypothetical proteins. The distribution of genes into COGs functional categories is presented in Table 4. Similar to representatives of the genus Desulfovibrio, the preferred substrates of D. retbaense are H2 and lactate, the latter which is incompletely oxidized to acetate. Several genes could be identified that are involved in H2 dependent sulfate reduction in Desulfovibrio species. It is assumed that in species of this genus H2 is oxidized by periplasmic Fe- or NiFeSe-hydrogenases and the resulting electrons are transferred to a pool of periplasmic cytochrome c3. Then, membrane-bound protein complexes transfer electrons from the pool of reduced cytochrome c3 to menaquinone or directly to cytoplasmic enzymes involved in the reduction of sulfate to sulfide . Recently, a novel molybdopterin oxidoreductase (Mop) could be identified in Desulfovibrio desulfuricans G20 that may represent a periplasm-facing transmembrane complex, which shuttles electrons from cytochrome c3 to the menaquinone pool . It is thought that electrons are transferred from the reduced quinone pool to adenosine phosphosulfate and sulfite via the membrane-bound respiratory complexes Qmo  and Dsr , respectively. A similar electron transfer chain for the oxidation of H2 with sulfate appears to be functional in D. retbaense: The uptake of H2 is probably catalyzed in this species by a heterodimeric NiFe- or NiFeSe-hydrogenase encoded by the genes Dret_0265 (hydB) and Dret_0266 (hydA). Six genes of the completed genome were annotated as cytochromes class III containing at least one domain with homology to a tetraheme cytochrome c3. Electrons could be transferred from the reduced cytochrome c pool to menaquinone by a putative Mop complex (Dret_0270/Dret_0273) that is located in close proximity to the hydrogenase genes. A membrane-bound Qmo complex (Dret_1963, Dret_1964, and Dret_1965) was also identified adjacent to the genes of the dissimilatory adenylyl sulfate reductase (aprAB). Likewise, genes encoding the five subunits DsrMKJOP complex (Dret_0235/Dret_0239) were found close to genes of the α and β subunits of the dissimilatory sulfite reductase (dsrAB). Hence, it appears that the proposed organization of the electron transfer chain from H2 to sulfate seems to be conserved not only in species of the genus Desulfovibrio, but also in other sulfate-reducing members of the Deltaproteobacteria. In Figure 4 an illustration of the hypothetical electron transfer chain in D. retbaense is given, which is mainly based on results previously obtained with H2-utilizing Desulfovibrio species. Proposed organization of the electron transfer chain in D. retbaense with H2 as electron donor and sulfate as electron acceptor. Gene products are designated according to the information given in Supplementary Table 1. Subunits of multiprotein complexes are labeled with capital letters. Abbreviations: APS, adenosine-5'-phosphosulfate; AMP, adenosine monophosphate; MQ, menaquinone; MQH2, dihydromenaquinone. Several genes that are involved in the incomplete oxidation of lactate to acetate could be detected in the complete genome sequence. The transport of lactate in the cytoplasm is probably facilitated by a specific permease encoded by the gene Dret_1039. Following transport, lactate is oxidized to pyruvate by a putative L-lactate dehydrogenase (Dret_0157). Pyruvate is then oxidatively decarboxylated by a pyruvate ferredoxin oxidoreductase to acetyl-CoA. Interestingly, the gene Dret_1036 encoding a homodimeric pyruvate ferredoxin oxidoreductase is located in close proximity to the lactate permease gene and genes responsible for the substrate level phosphorylation of ADP to ATP via conversion of acetyl-CoA to acetate, i.e. phosphotransacetylase (Dret_1035) and acetate kinase (Dret_1034). Besides substrate level phosphorylation, generation of ATP is also possible by the utilization of a chemiosmotic proton gradient through a F0F1 ATP synthase complex, which is encoded at two different sites of the genome. One gene cluster encodes the cytoplasmic F1 part along with the B-subunit of the membrane-bound F0 complex (Dret_2211/Dret_2217), whereas the remaining F0 subunits A (Dret_2087) and C (Dret_2086) are encoded elsewhere. D. retbaense is not able to grow autotrophically with CO2 as carbon source and needs acetate or complex carbon sources for growth with H2 as energy source. Intermediary carbon compounds required as precursors for the biosynthesis of cellular components are probably synthesized by a partial reverse tricarboxylic acid (TCA) cycle. A possible pathway for the assimilation of acetate starts with the synthesis of pyruvate from acetyl-CoA through a carboxylating reaction catalyzed by the pyruvate ferredoxin oxidoreductase (Dret_1036). Pyruvate can then be either activated to phosphoenolpyruvate by the enzyme pyruvate, water dikinase (Dret_0098) to enable gluconeogenesis or is further carboxylated to oxaloacetate by pyruvate carboxylase, which is encoded by two separate genes (Dret_0690 and Dret_1120). Alternatively, pyruvate can be also used for the synthesis of malate by malic enzyme (Dret_0778), which requires NADP+ as cofactor. The remaining major precursors for anabolic reactions can then be produced starting from malate by reactions of the reverse TCA cycle, involving the enzymes fumarase (Dret_1068, Dret_1069), fumarate reductase (Dret_1065, Dret_1066, and Dret_1067), succinyl-CoA synthetase (Dret_0545) and 2-oxoglutarate ferredoxin oxidoreductase (Dret_1400/Dret_1403). The important five carbon precursor 2-oxoglutarate could also be synthesized from citrate by aconitase (Dret_1771) and isocitrate dehydrogenase (Dret_0439). Genes encoding the enzymes ATP-citrate lyase or citrate synthase were not detected in the annotated genome sequence, so that a closing of the TCA cycle is apparently prevented. Cells of D. retbaense inhabit saline environments and hence need appropriate protection against low water activity or varying salt concentrations. The accumulation of compatible solutes is a widespread strategy among microorganisms to protect against osmotic stress. In the distantly related moderately halophilic sulfate-reducing bacterium Desulfovibrio halophilus, the organic solutes trehalose and glycine betaine were identified as osmoprotectants . In the genome of D. retbaense DSM 5692 several genes could be detected that may be involved in the intracellular synthesis or accumulation of the above mentioned compatible solutes. For instance, the organic solute trehalose can be synthesized from UDP-D-glucose and alpha-D-glucose 6-phosphate by the enzymes trehalose-6-phosphate synthase (Dret_1902) and trehalose-6-phosphatase (Dret_1903). Alternatively, trehalose may be produced from the reserve carbohydrate glycogen, if the enzymes malto-oligosyltrehalose synthase (Dret_0039) and malto-oligosyltrehalose trehalohydrolase (Dret_0037) are expressed. On the other hand, the gene Dret_0035 encodes a trehalose synthase that can transform maltose directly into trehalose and vice versa, so that an excess of trehalose can be converted to glycogen again. The second osmotic solute in D. retbaense appears to be glycine betaine, which can be accumulated in two different ways: The most efficient way in terms of energy represents the uptake from the environment. Glycine betaine is produced by many cyanobacteria or halophilic anoxygenic photosynthetic bacteria and is released continuously in the environment by excretion or cell lysis. The genome of D. retbaense DSM 5692 contains two distinct gene clusters (Dret_0768/Dret_0771 and Dret_22771/Dret_22773) that could encode high affinity ABC transporters for the uptake of glycine betaine. Several separate genes encoding periplasmic glycine betaine binding proteins were also found and could have a function in the regulation of genes in response to the presence of glycine betaine in the environment. An alternative route for the accumulation of glycine betaine is based on the uptake of choline. This quaternary amine is an essential component of eukaryotic cell membranes and hence ubiquitous in most environments. Two genes were found that encode putative choline transporters, Dret_1055 and Dret_2376. Following transport to the cytoplasm, choline could then be oxidized to glycine betaine by the enzymes choline dehydrogenase (Dret_0130) and betaine aldehyde dehydrogenase (Dret_0129). The sensitivity of the obligately anaerobic species D. retbaense to oxygen exposure has not been analyzed in detail, but it can be assumed that it is quite moderate as in most other studied sulfate-reducing bacteria . A close inspection of the annotated genome sequence revealed a complex network of antioxidant proteins protecting cells of this species against oxidative stress. Aerobic respiration was identified as one principal mechanism for the detoxification of oxygen in Gram-negative sulfate-reducers . In D. retbaense DSM 5692, genes for the two subunits of a cytochrome bd quinol oxidase (Dret_0135 and Dret_0136) were identified. This type of oxidase is the most common terminal oxidase among Gram-negative sulfate-reducers and characterized by a high-affinity to oxygen [32,33]. For the detoxification of reactive oxygen species that emerge from the contact of oxygen with cellular redox enzymes several protection systems seem to be present. A di-heme cytochrome c peroxidase (Dret_1885) that is probably localized in the periplasmic space  is able to reduce H2O2 to water, whereas a catalase (Dret_1236) produces oxygen from the inactivation of H2O2. On the other hand, in the cytoplasm multiprotein complexes containing rubredoxins (Dret_0886, Dret_0139), rubrerythrins (Dret_0191, Dret_1205, Dret_1644, Dret_2310) and desulfoferrodoxin (Dret_0140) could establish electron transfer systems for the reduction of superoxide radicals and H2O2 [35,36]. 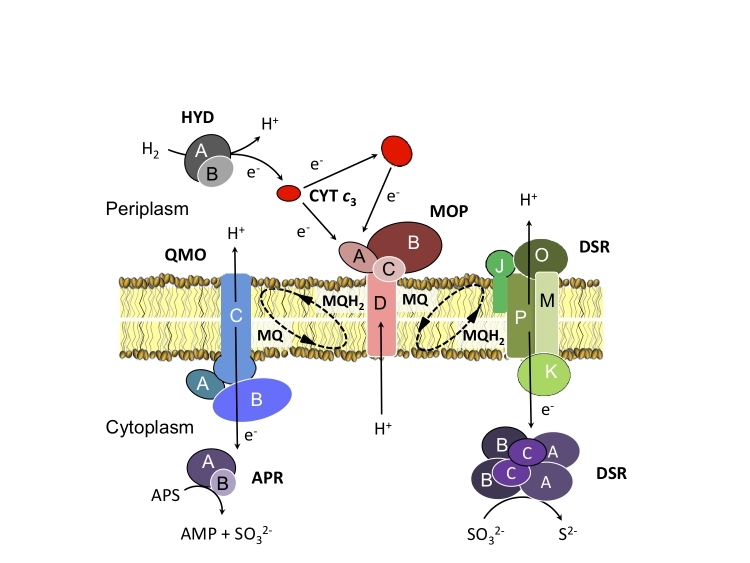 Finally, cellular proteins and lipids that became damaged by reactive oxygen species could be repaired by a methionine sulfoxide reductase (Dret_2264), peroxiredoxin (Dret_2393) and an alkylhydroperoxidase (Dret_1223). Thus, based on the results of the genome analysis it seems that this species is very well adapted to frequent changes in salinity and redox conditions in its natural environment, the sediments of hypersaline lakes. We would like to gratefully acknowledge the help of Susanne Schneider (DSMZ) for DNA extraction and quality analysis. This work was performed under the auspices of the US Department of Energy's Office of Science, Biological and Environmental Research Program, and by the University of California, Lawrence Berkeley National Laboratory under contract No. DE-AC02-05CH11231, Lawrence Livermore National Laboratory under Contract No. DE-AC52-07NA27344, and Los Alamos National Laboratory under contract. German Research Foundation (DFG) supported DSMZ under INST 599/1-1. Kuever J, Rainey FA, Widdel F. Family III. Desulfohalobiaceae fam. nov. In Bergey's Manual of Systematic Bacteriology 2nd ed. (Brenner DJ, Krieg NR, Staley JT and Garrity GM, eds. ), Springer Verlag, New York 2005; 2:948–949. Garrity GM, Holt JG. Taxonomic Outline of the Archaea and Bacteria Bergey's Manual of Systematic Bacteriology 2nd ed. (Boone DR and Castenholz RW, eds. ), Springer-Verlag, New York 2001; 1:155-166. Han CS, Chain P. Finishing repeat regions automatically with Dupfinisher. In: Proceeding of the 2006 international conference on bioinformatics & computational biology. Hamid R Arabnia & Homayoun Valafar (eds), CSREA Press. June 26-29, 2006:141-146.